I love this fibre from Loopy. 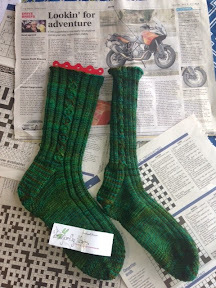 She managed to lose one sock of her previous handknitted pair whilst on a motorcycle tour on Sth America. She visited The Galapagos hence the choice of yarn. Row 2: Hold the first stitch in front of work, k2, knit the held stitch, K1, hold the next 2 sts at back of work, K the next st, knit the 2 sts held at the back. Row 5: K2, Sl 1, K1, Sl 1, K2. 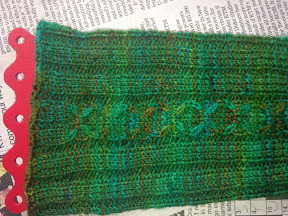 Row 6: Hold 2 stitches at back of work, knit the next stitch, K 1, hold the next stitch at front, K2, then knit the held stitch . Row 7 and 8: Knit. If you can't follow the instructions please contact me and I'll try to help.. But in the meantime the picture of the detail might be helpful. Who was that naughty girl that was so irresponsible as to lose a 'hand knitted with love sock' overseas? She is very naughty. But she is an adventurer and they can not be expected to be responsible about the mundanities of this world(such as accounting for the whereabouts of errant socks). They have important adventures to plan and do. I feel sorry for the missing sock's finder. Forever nonplussed about the origin of such a wondrous artefact, musing, perhaps, about the mysterious, possibly romantic, identity of the wearer, ever hoping it's twin will appear, unable to let go of the ambiguous sock. Or perhaps it is now a repository for motorcycle tools under some capacious rump.